Sunday April 21st 1907 I was busy with the work most of the forenoon. Dr Potter was here to see "Lady" again. Billy was not here for dinner. I went down home at 1.37 and came back at 5.20. Otts folks and Aunt Fannie [Hepburn?] were up home. It was bed-time when the evening work was done. 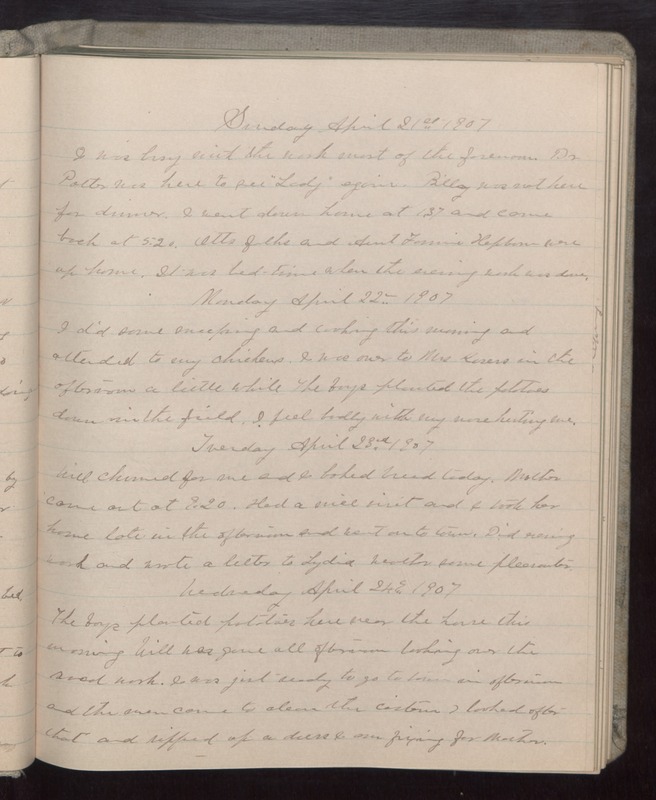 Monday April 22 1907 I did some sweeping and cooking this morning and attended to my chickens. I was over to Mrs. [Kovers?] in the afternoon a little while The boys planted the potatoes down in the field. I feel badly with my [nose?] hurting me. Tuesday April 23 1907 Will churned for me and I baked bread today. Mother came out at 9.20. Had a nice visit and I took her home late in the afternoon and went on to town. Did evening work and wrote a letter to Lydia Weather some pleasanter. Wednesday April 24 1907 The boys planted potatoes here near the house this morning. Will was gone all afternoon looking over the road work. I was jist ready to go to town in afternoon and the men came to clean the [illegible]. I looked after that and ripped up a dress I am fixing for Mother.